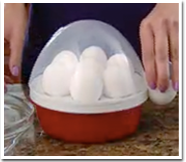 Big Boss™ Egg Genie™ - Now cook hard, medium, and soft boiled eggs in a flash! 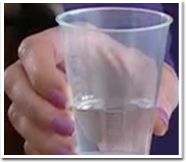 Using Egg Genie™ Is As Easy 1-2-3! Medium or Soft Boiled Eggs. Yes, please send me the Free Bacon Wave and just pay $6.95 S&H! 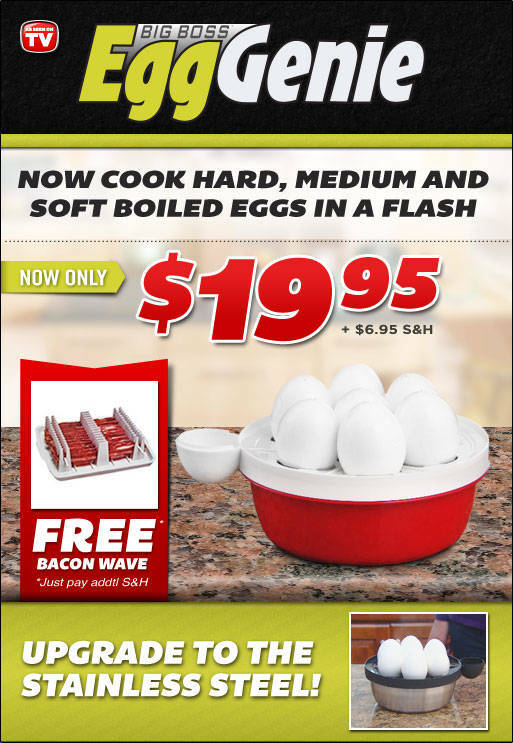 Buy One Big Boss™ Egg Genie™ for $19.95 plus $6.95 S&H and as a bonus, we will send you a FREE Bacon Wave, just pay an additional $6.95 S&H. You will have an opportunity to upgrade to the stainless steel option during checkout. Taxable will apply to the following states: CA, NJ, NV, NY. A shipping surcharge of $9.95 will apply to orders from Puerto Rico, $10.00 - Alaska & Hawaii.